(2010/TOMPKIN SQUARE) 14 tracks (43:05) recorded live at the Gram Parsons Guitar Pull & Tribute Festival, Waycross, GA 2009. On February 22, 1956, The Louvin Brothers warmed up for Elvis Presley at City Auditorium in Waycross, GA. On hand was a nine year old boy named Gram Parsons. It would leave an idelible mark on the future legend, who went on to popularize several Louvin Brothers songs for the ages. 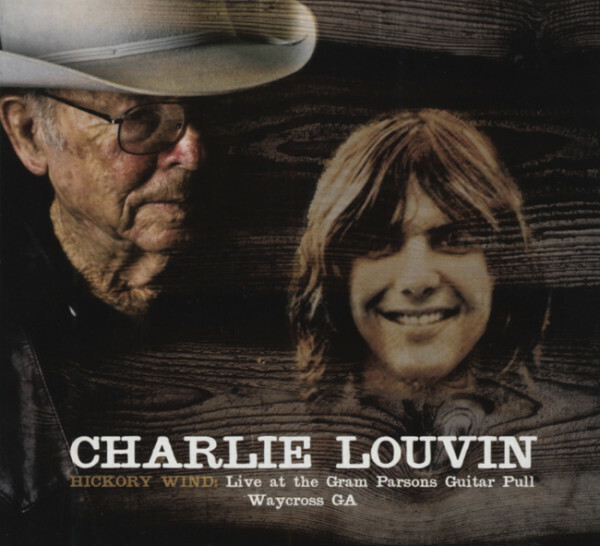 On September 19, 2009, Charlie returned to Waycross to pay tribute to the granddaddy of 'Alt Country'/'Americana', singing 'Hickory Wind' for the first time ever, as well as Louvin Brothers songs Gram either recorded or must have heard in his early years. If Gram is the granddaddy, Charlie is the great-granddaddy; a Country Music Hall of Famer, and a legend in the truest sense of the word. In 1968, Dallas Frazier was still under contract to Capitol Records. In the time he'd been on the label, he'd become one of Nashville's top songwriters, but saved none of his best songs for himself. This was another he let go, but it found good homes with two other Capitol artists, Merle Haggard and Charlie Louvin. Haggard recorded this piece of grand guignol country for his 'Sing Me Back Home' LP, the same album that included either the first or a very early version of another Frazier tune, The Son Of Hickory Holler's Tramp. Knowing that it would be an album track, it's possible that Capitol's Ken Nelson saw the potential of Will You Visit Me On Sundays and suggested that Charlie Louvin record it as a single. Louvin's session wasthree months after Haggard's but his single came out one month before Haggard's LP. (At the same session, Louvin cut It Ain't No Big Thing (But It's Growing), a song cowritten by Alice Joy, who'd made the original recording of Harper Valley PTA. Elvis Presley remembered that one and recorded it three years later). In 1968, Gram Parsons was using some of his trust fund income to pay friends to look for Louvin Brothers LPs, and he featured a Louvins song on 'Sweetheart Of The Rodeo.' Otherwise, interest in the Louvins was near zero. Ira was dead and this was Charlie’s eleventh solo hit. In 1968, he opened his own record store in Franklin, Tennessee and announced that he'd sold 225 copies of Will You Visit Me On Sundays, but it died at #20. It had a good afterlife, though. George Jones recorded it, as did the duet of Conway Twitty and Loretta Lynn. Later still, Marty Stuart revisited it. Charlie Louvin died on January 26, 2011 at his home in Wartrace, Tennessee. Kundenbewertungen für "Hickory Wind: Live At The Gram Parsons Guitar"